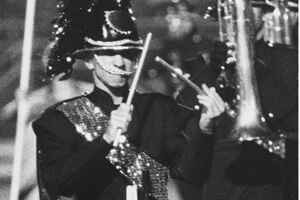 For many fans, what made Phantom Regiment's 1995 fifth place production of "Adventures Under a Darkened Sky" so shocking upon first viewing was the corps' move to solid black uniforms after many years in mostly solid white. The relatively somber show was based entirely on the works of Sergei Rachmaninoff. Despite the seriousness of the music and the foreboding visuals of the black uniforms and black helmets of the brass and percussion, (in an era well before so many corps adapted such a visual palette for their costuming), the Romantic music was imbued with a broad stateliness that tempered the solemnity and darkness of much of the music. The corps started mostly to the left of the 50-yard line with an introductory snippet of "Capriccio Bohemian," then crossed the invisible dividing line between dusk and night as it moved from left to right. The uniforms perfectly enhanced the evolution into darkness while the sparkling silver sashes may well have intended to reflect the twinkling of the stars overhead. Dark blue drums seemed to have been chosen for the dusk-like quality of the color, while a black strip through the purple flags appeared to capture the transition to night. In "Symphonic Dances," the Latin mass "Dies Irae" ("Day of Wrath") is heard, contributing to the dark mood. This chant is heard elsewhere in the music as well, though craftily worked into the musical fabric by Rachmaninoff so the melody most often associated with death in the repertoires of so many composers wasn't so overbearing. "Rhapsody on a Theme of Paganini—Variation 18" featured visually one of the most memorable moments of any corps in 1995, with the corps appearing in a "group photo" that inspired a huge number of photographs snapped by the audience. At first, only one mellophone was captured in the picture frame of the photo shoot, soon joined by a baritone. Then, one by one, three other picture frames appeared, created by stretching apart two poles that were connected by stretch silver fabric similar in appearance from a distance to that of the sashes. We didn't really fully grasp that the props were picture frames until the full-corps photo op behind all four of the "frames." Seen live, this was one of those effects, simple in concept and execution and so perfect in the moment, it sent chills down the spine. 1995 Phantom Regiment performance excerpt. In "Capriccio Bohemian," red flags (with three swatches of black) let us know night was on its last legs invading the solace of darkness. After a vigorous fanfare guaranteed to wake one up from the sleep of night, a drum feature saw snare drummers playing their drums with just their right sticks, their left hands holding jingle sticks that produced a loud rattling sound. The final section of the work saw a reprise of the opening statement of the show, with yellow flags emblazoned with the strips of black similar to what we saw earlier with the purple flags. Instead of descending into the pitch-blackness of night, the show progressed into the brightness of daylight, with the strip of black on the flags showing that night was not willing to let go without a fight. Wildly exposed soprano runs up and down the scale and a jubilantly tolling church bell welcomed the new day of rebirth and hope, leaving the audience pumped up and refreshed. The sonic celebration pushed all vestiges of night into the background, almost blasting the black off the uniforms. This week only, you can save on 1995 World Championship Audio and Video Performance Downloads on the DCI Fan Network. Buy the 1995 Phantom Regiment Video Performance Download. (Available this week only for $3.99. Regular price: $4.99.) Buy the Audio Performance Download bundle of all 12 Finalists from 1995. (Available this week only for $15.99. Regular price: $19.99.) Offer ends Monday, Dec. 19 at 8:30 a.m. ET.